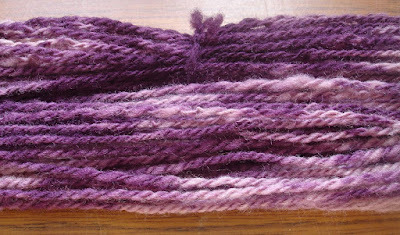 Stitchin' Bints: Can you guess what I've used to dye this skein? Can you guess what I've used to dye this skein? Have a guess before reading on. When I reached a certain age, like a lot of women, I began visiting Boots the chemist every few weeks for that bottle of chemical magic that covers my grey hairs. Another thing that happens when you reach a certain age is that you have your hair cut shorter each time. I have no idea why - it's just what you do, isn't it? Therefore, nowadays I only get through about half the bottle. Last night while looking at the left-over dye, I remembered the two skeins of plain wool I have, and a light bulb came on. With no real idea about dyeing wool, especially with hair dye, I just squirted it on, trying not to get it too even and left it for the half-hour that you're supposed to leave it on your hair. I give you the result! Mmmmmm ribena. 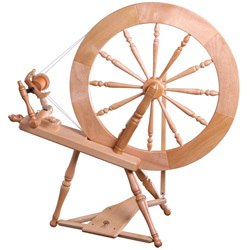 In the past I've always dyed the wool before spinning, and it'll be interesting to compare the two techniques when this is knitted up. I'm also very pleased with my new camera. £30 from ebay plus £10 for a new memory card (They didn't say they weren't including it. Grrrr.) Enlarge the photo above to see the detail. My photos might be even better once I've got around to cleaning the previous owner's fingerprint off the lens!! You'll also see that my yarn isn't as even as I'd like. Hmmm. Maybe there's a lot to be said for crappy old cameras which hide a multitude of sins with their fuzziness. What to make with this? I'm thinking about Toasty or Toast - or something similar with a bit of a pattern to it. What do you think? Maybe it would be in keeping to make a hat! lol. Can I spin the hair from my pet?